A new newspaper aimed at the 48pc of voters who voted to stay in the European Union has hit the streets today. Publisher Archant said the title has been delivered to market faster than any other British newspaper in history – just nine days from concept to newsagent. Priced £2, the paper will initially run for four issues, with subsequent print runs being decided by reader interest. A web page promoting the new title has also gone live. 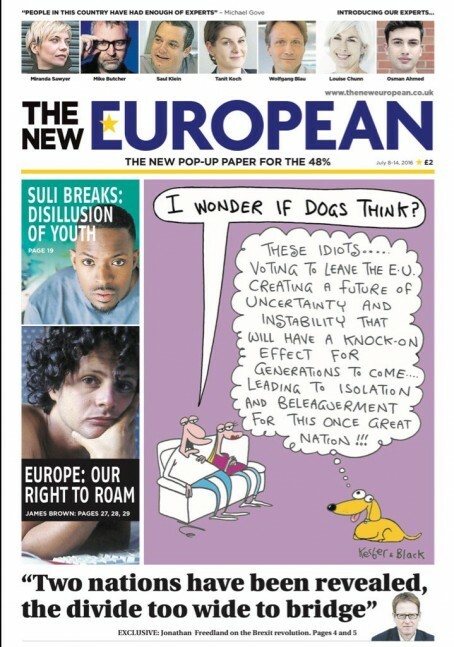 It says: “The New European is not aligned with old political divisions but with an enthusiasm and love for Europe; a new quality newspaper that gives voice to the values of the 48%. “The New European will provide in-depth analysis of the Brexit process, its implications and progress as well as a celebration of European life and culture with contributions from some of the most respected journalists and opinion formers from the UK and Europe. “We will celebrate both the highbrow and the fun with exciting features and news on cultural, fashion and artistic events across the UK and the continent and inspiring articles on how to get out there and enjoy them. Matt has written more extensively of the thinking behind the launch in a blog post which can be read here. He said that while the 52pc who voted Leave had been well represented by the national press, there was no “visible articulation” of the 48pc who had voted the other way. Erm, yes, OK. Nine days looks about right. A New Day for the Remain camp; I wonder how it will feature in HTFP’s round-up of the year come December. A footnote at best I fear. I really hope HTFP does the basics and follows up its own stories, too many come and go without being revisited. I’m really curious as to how many copies the new CN daily title is selling and will be equally curious as to how this performs. I wish The New European the very best of luck and I warmly welcome people continuing to invest in newspapers, which surely should be used as the bridge to what we know will be a digital future. They should be cherished and cared for, not seen as a legacy embarrassment – something to be squeezed, exploited and killed off. That front page is awful though and I’d be surprised if it lasts even the month. Well said, NQ wage slave. The BBC is always doing what you go on about, but then the BBC is mostly comment anyway, not news (couldn’t resist getting that dig in). Possibly the worst front page I have seen for years. If only Archant would invest in the print titles it already has and stops ‘playing’ at being a national, then it may actually be a decent producer of decent papers. Actually don’t mind the front page. Seen worse on my paper. But £2? Sorry, that’s a real deterrent. Every newsagent I passed today had queues round the block with punters keen to get their hands on this fantastic new product. My previous comments suggested it would bite the dust in double quick time. I hadn’t realised when I made that remark that it was only £2. What a bargain. Haha, a planned four issues? It won’t get to three. In fairness, they have done a decent job on such a short timespan. Hand on heart though I cannot see a reason to buy it again. Judging by the look of the front page I’m amazed it took that long to put together. If they had courage in their convictions the first issue would be free to pick up followed by a paid for 3-4 week campaign, that way potential readers could try before they buy to see whether it warrants its ambitious £2 cover charge. Expecting a limited audience to buy a new untried paper at a high price smacks of not thinking this one through.